Who We Are — Purple People Inc.
Purple is associated with royalty, spirituality and healing, and synonymous with the promotion of peace, compassion and kindness. Founder Susan Faith Broude was drawn to the color purple during her healing journey 20 years ago while meditating. She found that wearing purple clothes and amethyst stone jewelry grounded her into her core and she connected deeply to her authentic self. Author Susan Faith (center) receiving book awards. Watch this "Purple" video created by Tami Pivnick and Susan Broude ©2016 Purple People Inc.
Susan Faith Broude lives in her truth. “I always carry the light within me so the sun always shines in my heart.” Susan founded Purple People Inc. 20 years ago after experiencing life-threatening challenges. As she was told to say good-bye to her young child, she experienced a deep connection to her authenticity for her healing journey. Her life’s purpose is to make a positive impact on the world. Susan offers insight and inspiration for healing by empowering others to honor our differences, celebrate diversity and to shine her light for others to know they are innately able to heal. 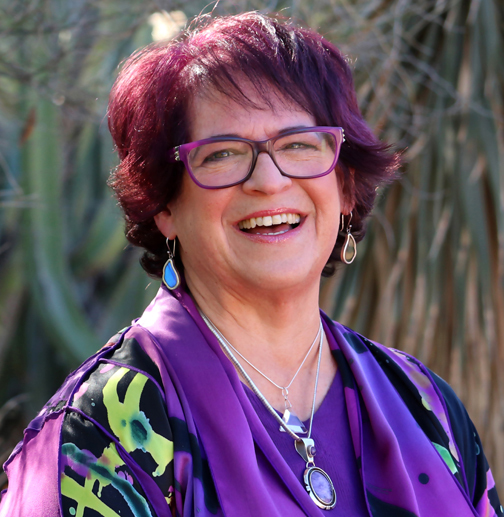 Trained as an attorney and with 35 plus years of business experience, Susan’s passion is to inspire others to connect to their soul’s purpose and live a life full of love, compassion, kindness and respect. Susan Faith’s Award-Winning Books, including PURPLE LOVE and PURPLE PUPPY, are inspirational children’s books that build empathy, focus on positive self-esteem and embrace nature and all living things. Susan’s newest book contribution is her chapter, “Perfectly Imperfect,” in the #1 Best Selling Series, which includes, “Women Who Influence.” Women Who Influence is a collection of uplifting stories by 30 powerful women who share their journeys to fuel the souls of women globally. Her message that “You are Perfect Just the Way You Are” for all of her books is based on her motivational program of self-love. Susan’s vision to impact a broader audience beyond books expands into documentary films that make a difference with the creation of Dog Eats Hat Productions. She is the executive producer and writer of several films, including Let It Begin! A Filmmaker’s Journey, nominated for the 2011 Student Academy Award in Short Documentary. Recognizing the global impact of bullying, Susan produced and wrote the award-winning feature film, Bullied to Silence, which focuses on verbal and cyber-bullying. Susan brings awareness to diversity as Bullied to Silence shares stories of dozens of youth and adults from all walks of life, ethnicities, physical challenges, sexual orientations, and international communities. Susan champions the Movement to Be the Positive Change to Verbal and Cyber-bullying with the goal to impact and educate over 100,000 people by 2023. Susan nourishes her soul by spending quiet time with Tami, taking walks in nature, frolicking at the ocean, going to movies, laughing with friends, playing with dogs, and singing off-key!! Honor Our Differences. Celebrate Diversity! Overcoming Challenge by Creating Legacy to Make Life Matter! Tami Pivnick, Vice President & Creative Director of Purple People Inc.
Tami has been involved with broadcast, film and print media for over 35 years. At CNN-Atlanta, she was on-air Graphic Designer, after moving to Los Angeles, she directed trailers, music videos, and motion graphics for John Denver's Windstar Foundation. She worked at WFAA-TV in Dallas as a Broadcast Designer and as Art Director for WSB-TV in Atlanta where she covered the Columbine tragedy. In the past 15 years, Tami has been VP of Production and the Creative Director for Purple People Inc. The powerful, topical award-winning BULLIED TO SILENCE is her most recent large scale film. Numerous non-profit organizations, equal rights organizations, and educational institutions have shown two of her films "Purple" and "Are You Listening?" Tami has been instrumental with Susan in establishing a film production company, Dog Eats Hat Productions. The documentary "Let It Begin! A Filmmaker's Journey" directed by Tami and produced by Susan won Audience Choice and Best Director Awards and was nominated for a 2011 Academy Award in Short Documentary. Over the span of her vast artistic career, one of her proudest accomplishments is that of creating a short documentary for Westside Special Olympics in Los Angeles. — Jack Canfield, Co-Creator "Chicken Soup for the Soul"